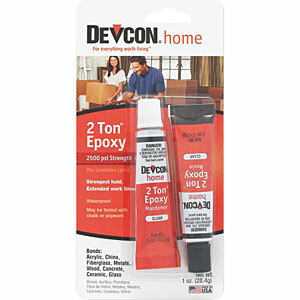 Finding good adhesives is often difficult and local stores don't always carry them. I am glad to share my expertise with you, but please always test the products yourself on a sample first. Make sure you the result is as desired and follow basic safety precautions to help ensure that your application is successful and safe! • Always test your glues and use them with caution on any work of heirloom quality as adhesives may fail over time. • When applying from large tube to small area, place some glue on a piece of cardboard and use a small T-pin. • Use only in a well ventilated room, outside or wear a respirator. Health and Safety Issues - Be careful when using any glue product and read the all the instructions on the packaging. Assume that the products are toxic, work in a well ventilated area to avoid breathing the fumes. Use a toxic fume respirator for long exposure. Make sure to keep the cap on the glue when you're not using it. 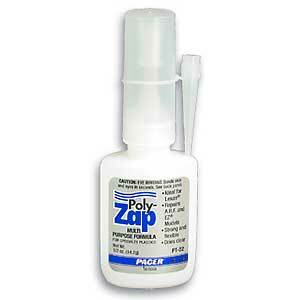 This will help keep the glue from drying out and prevent any spillage if you were to accidentally knock the glue over. Keep all adhesive products out of reach of children and pets. And most importantly, be cautious – Glues bonds skin and eyes in seconds. For Nylon Cords - Great for nylon cords, but be careful if using this product next to beads as it may discolor them or leave a milky film. Designed for specialty plastics. It dries quickly as most super glues. 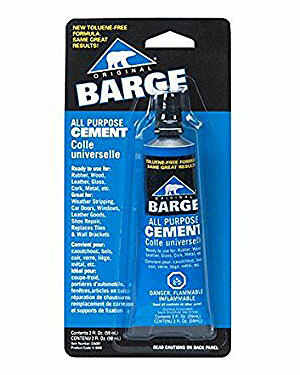 Personal note - I have used this glue for years and I have encoutered very few failure with this product. For bond between a cord and a clasp, the fit has to be perfect with no gaps. This glue will bot fill the gaps! Recommended for securing clasp to cords and for kumihimo findings. Personal note - I have tested it. It works well to attach cords to metal findings. For cord ends, I prefer Poly-Zap for the 1st step (gluing the cord ends together), but I like this adhesive for the second step (attaching the glued cord ends to the finding). As to its lasting quality, it will need to be tested over time but so far so good and all Pacer products seem to be of good quality! For Metal to Fiber - A good clear epoxy. Comes in two tubes. Even amounts needs to be mixed. Sets in 5 minutes, can be handled in 15 minutes. Full bond within 1 hour. Cures overnight. 1500 psi strength. Dries transparent. For more technical information click on image. Shipped by ground Parcel Post or UPS ground only! 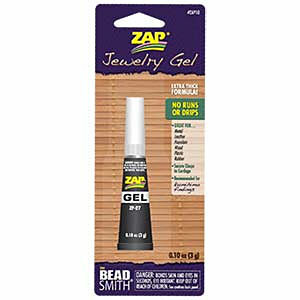 Personal note - I use this epoxy to glue my kumihimo braids into sterling silver tubular clasps. I mix mine with a T-pin on a piece of cardboard, coat the inside of the tube/barrel, then insert the kumihimo end. I let it dry overnight. Mix only small amount at a time as it sets quickly and make sure the quantity from each tube is even, otherwise the epoxy will not set properly. For Metal to Fiber - A good clear epoxy. Comes in two tubes. Even amounts needs to be mixed. 30 minutes handling & set times. Cures in 8-10 hours. Dries clear. 2500 psi strength. Personal note - Perfect when you need a bit more time to work with, a clearer color and a stronger bond. For Nylon/Silk Thread and Beads - Originally designed for the watch repair industry. Comes with a precision tip applicator shown on bottom right of the picture great for application of just one mini drop. Stays flexible and very clear when dried. No discoloration of semiprecious beads or pearls. Sets in 10 minutes and dries within 1 hour. Shelf-life about 1 year. Personal note - For jewelry with nylon or silk thread, it is a good choice for securing knots next to beads as it does not discolor most beads. It can also be squeezed inside the bead hole to secure the bead to a specific spot on the thread without the use of knots. When used to terminate the thread I recommend two applications: glue before cutting the thread, let dry, cut thread as desired and then glue again. May have a limited lifetime, as failures over time have been recorded, so use with caution on heirloom quality pieces. See Fray Check... as an alternative. Apply on both surfaces, allow to set 5-15 min., then press firmly together. Dries overnight. Stay flexible. Colored, yellowish in tone. Toluene-Free Formula. For more technical information click on image. Click here for MSDS. Personal notes - I use this glue to bond leather to the back of cabochons and/or solidly knotted area where I fused ends of thread. Careful application is necessary as this glue is colored and it will discolor thread and leather! 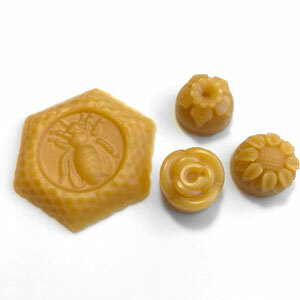 My local beeskeepers quit making my molded beeswax cakes about a year ago and sent me their molds. We are now making the beeswax cakes here in house. Our new batch, made in September 2017 is 100% pure organic beeswax from Oregon. Each hexagonal cake weighs approximately 22 g. and is about 2 1/2" (6.5 cm) in diameter and 1/2" (1.5 cm) thick. 1. Loosen thread end and wax. 2. Fray with scissors blade, wax again. 3. Refray & shred with blade, removing some of the fiber until end thins. 4. Rewax and cut at angle. Rewax as needed when stringing beads. Beeswax is sensitive to temperature changes. If it gets too hot, soft or sticky, place it in the refridgerator to harden it. Personal note - I have used beeswax for many years for making self needles and for conditioning C-Lon Bead Thread Size D for beading. It smells good and it is a natural product made by our allies, the bees, the wonder workers! I keep several beeswax cakes on hand and one in my traveling pouch. 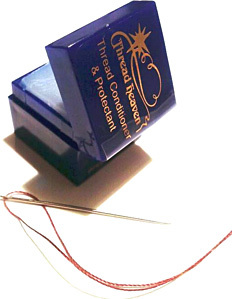 Thread Heaven is a thread conditioner and protector. It extend the life of the thread and protect it from UV rays. It does not freeze or melt and it is acid-free & non-toxic. Personal note - A customer gave me a box a few years ago, so it has been in my tool drawer for a while, but I resisted trying and using this product, thinking beeswax was the best natural product... But after a long talk with a thread rep, I am giving it a try. We talked about the shelf life of bonded nylon and I found out that if it is stored properly - with no moisture and in a clean place, bonded nylon has an indefinite shelf life. But the thread rep suggested that if the thread or cord gets a bit brittle, a thread conditioner, something like Thread Heaven, can restore it to its original condition and further protect it for the future. Plus, it is non toxic, acid-free and can be used in combination with beeswax if desired, so yes, I will be using it in the future. 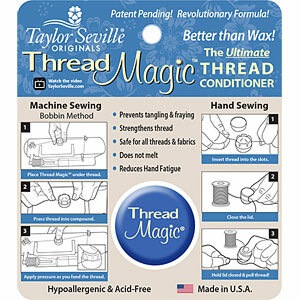 Thread Magic is a thread conditioner and protector. It extend the life of the thread and protect it from UV rays. It does not freeze or melt and it is acid-free & non-toxic. Highly recommended for coating C-Lon Bead Thread, plus for any area where the thread or cord are subject to friction as in knotted slides. Also use if bond on nylon cord (C-Lon Bead Cord/D&E Nylon #18) becomes brittle. Personal note - Just like Thread Heaven, in a larger quantity and in a fancier box. A thin clear plastic liquid, similar to glue, to seal the ends of thread and keep them from fraying. It is colorless, smells like rubbing alcohol and has a new improved fine tip. When opening the bottle for the first time, poke a hole in the tip with a fine pin. Always test first. Allow 5-10 minutes to dry. Fray Check dries clear but may darken the color of the thread. On the plus side, it’s washable and dry cleanable. For more technical information go to the Dritz website, and clik on image for written information on the box. Personal note - For self-needles, it is superior to super glue or nail polish, but I still prefer beeswax. I tested it on several nylon #18/C-Lon Bead Cord thread. It darkens light colors. It does not leave much residue on the fingers when smoothing along the thread, as it is a type of nylon suspended in rubbing alcohol. The alcohol evaporates and the product then dries on the thread or piece of fabric/ribbon on which it has been applied. Very good to secure knots and thread ends. This liquid plastic prevents fraying and is also excellent for securing the ends of threads. Designed to dry clear to avoid discoloration, it also dries quickly and leaves fabric soft and flexible. Machine-washable or dry-able. Comes with an ultra-fine nozzle-tip which allows for precise application and helps get to hard-to-reach areas. For more information click on image. 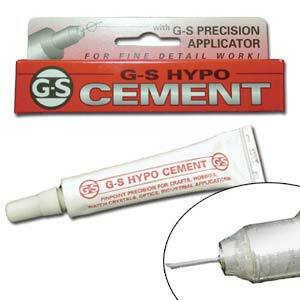 Personal note - Great as a thread conditioner to add more abrasion resistance or more 'bond' to cord. When compared to Fray Check, Fray Block dried first, left a lighter feel on the thread and no discoloration whereas Fray Check darken the thread a bit. As a bond for knots, Fray Check is easier to apply as the bottle is clear.